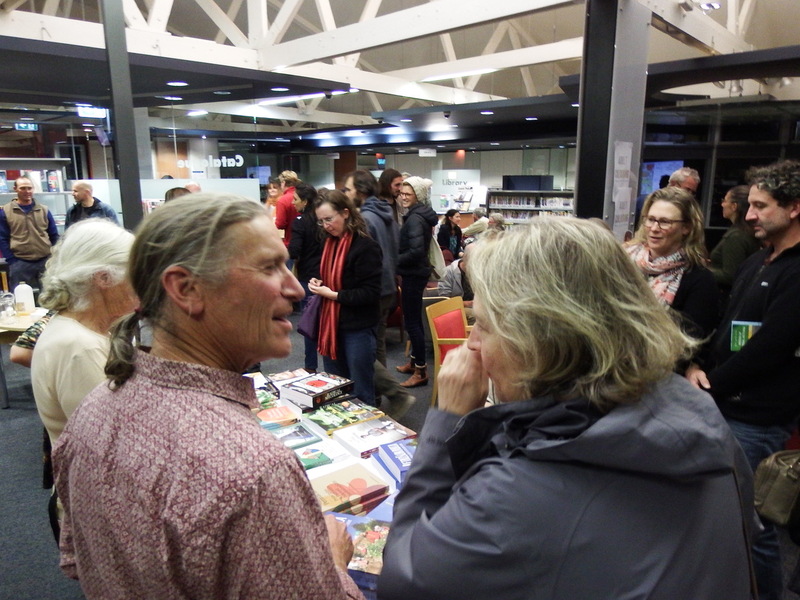 The night began with banter between locals Peter Lockyer and Richard Telford focused on retrofitting projects of the built environment, including Abdallah House and three other properties, all within a kilometre of the library. The common thread was in considering the solar aspect, and modifying the existing resources and infrastructure of the sites to increase self-reliance. 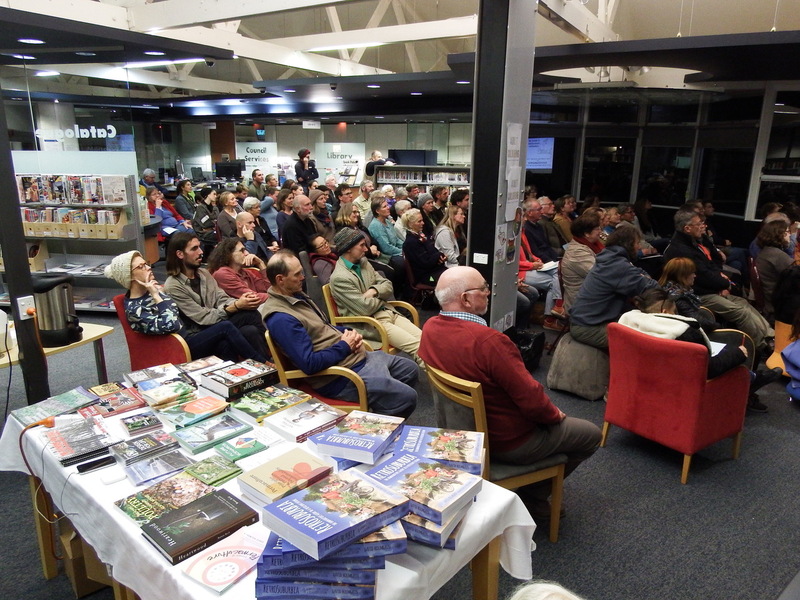 David introduced ‘Aussie Street’, a compelling story from the ‘new suburbs’ of the 1950s and their evolution through the decades. People in the audience could relate to the made-up characters that live in the street, and the drama of their lives. 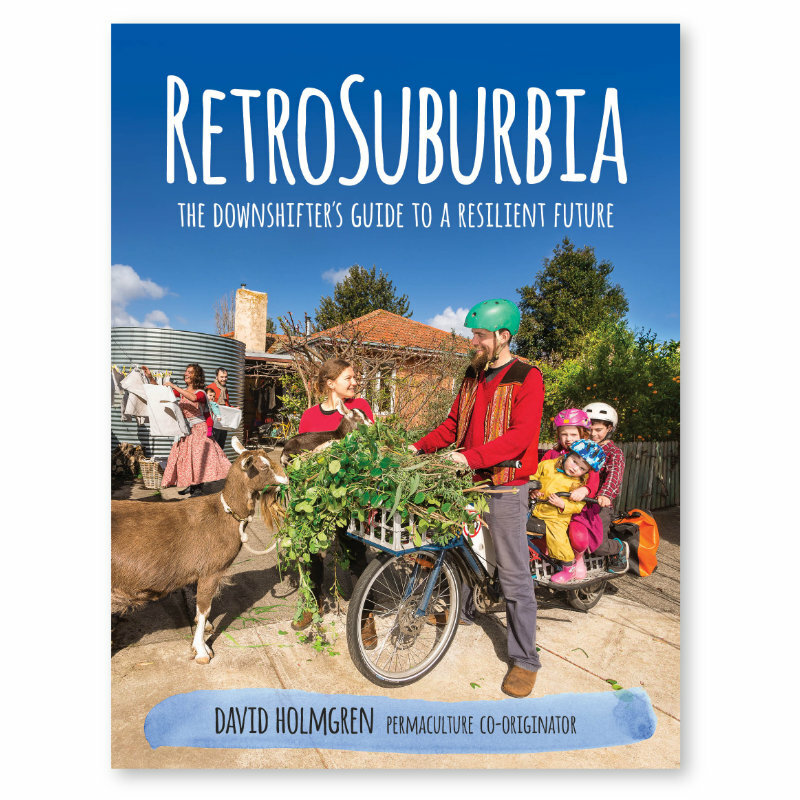 Each of the four properties illustrated various realistic approaches to suburban living, and adaption to changing times. 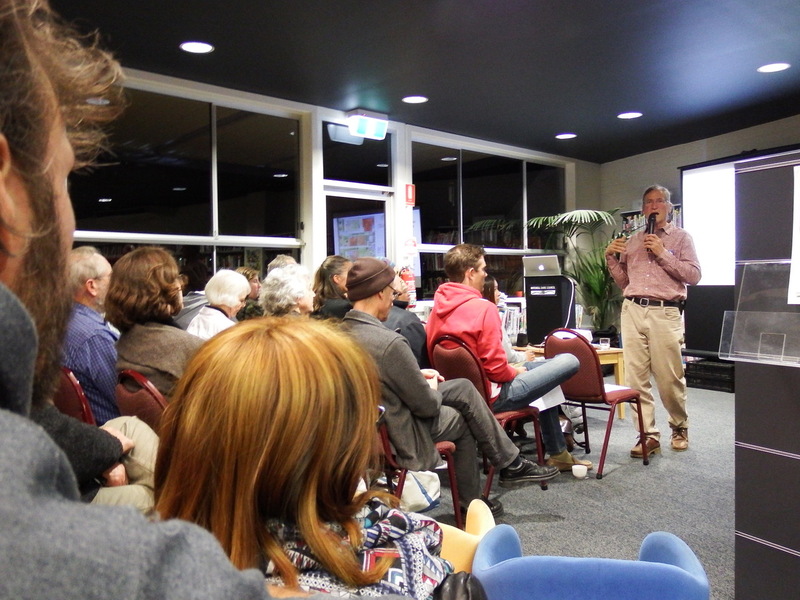 Question time raised lots of concerns about regulatory requirements, and how David’s vision of a suburban transformation could be realised. 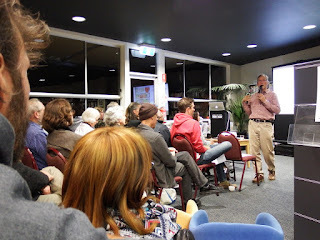 David acknowledged the importance of the rules and regulations required by council to curb unethical behaviour, particularly by corporations. 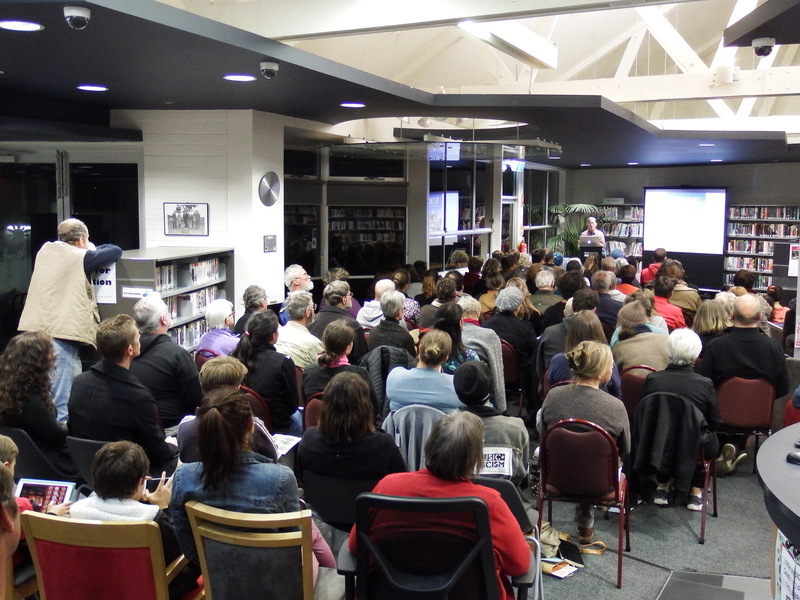 But he also challenged the audience, along with the three councillors in attendance, to make incremental changes where they live – even if that means bending a few rules. Building relationships and trust with neighbours give residents the social license to enhance the properties where they live, and build community at the same time. This entry was posted in Uncategorised on May 17, 2018 by Richard Telford. I recognise that there are few other independent groups in our region that have a voice, and stand up for issues that affect our environment. We, as a group, fill a vital role for our wider community. We are facing a very interesting time in our region as we transition to renewables, especially up here in Seymour, with the pumped hydro, wind farm and community solar on the cards. Looking back over the past year I was surprised to see how much we have taken on and achieved as a group. This entry was posted in Uncategorised on September 18, 2017 by Richard Telford. The day started out cool but sunny. We decided to clean up along the Kilmore Creek from the back of the fish and chip shop [Union St] and went north to the back of foodworks. The rubbish mainly consisted of plastic bags which you can see from the attached photos. It was disturbing to see three of the shopping trollies l pulled out of the creek and put in one area for ease of pick up at the corner of Patrick and Mills St [with coles advised to pick them up with the pick up location etc] had been thrown back in the creek in the same location. There was also a lot of packaging material [wrap and Styrofoam] at the back of the furniture store. We were doing so well [although the long wet grass made it difficult to get real close to the creek] we decided to cross the creek and return back via the other side. We made it back to Union rd and decided to keep going back to mill st when the skies opened up with rain and hail. We shortly thereafter, pulled the pin and decided not to worry about lunch as a hot shower seemed more inviting for some! There was a competition for the strangest/most interesting thing found. It was a thong and not the type you put on your feet! Overall, we picked up over a dozen bags of rubbish and recycling. This time [to my surprise] it was mostly rubbish due to plastic bags and packaging. In summary, the trial event was very successful even though it was not advertised and so we hope it may become a monthly event. Next time we are looking at picking up, as suggested by Marie, on East street near the golf course. This entry was posted in Uncategorised on May 30, 2017 by Richard Telford. 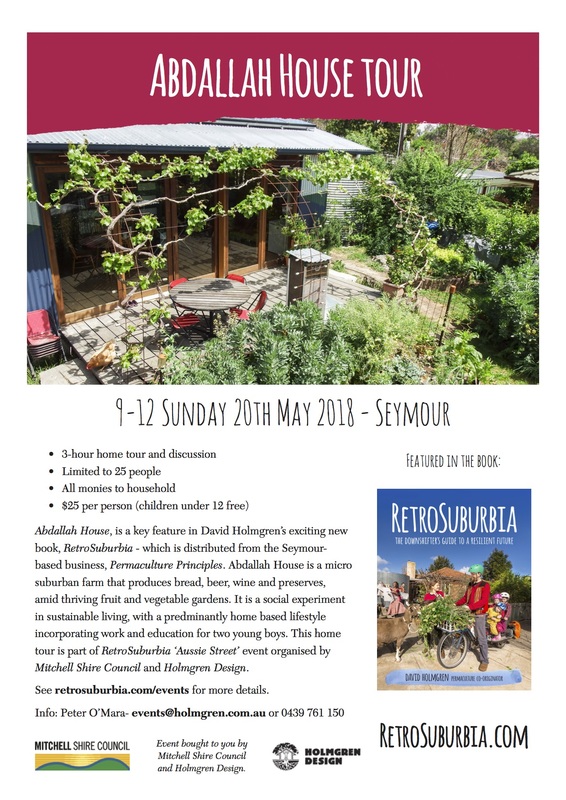 Sustainable Seymour Projects on the go! Renewable energy continues to be the main thrust of the Sustainable Seymour group. Due to the low head and large amount of water needed, the capacity of the Strathbogie project, utilising Waterhouse and Abbinga reservoirs, is about 2 MW, which is the capacity of the diesel generator now used at peak times. But at such time,s the water demand for other purposes is also high so may not be available for hydro-generation. New pipe is also needed which could cost $4 million. At Trawool the head a(290 metres) and volume of water (5o megalitres) being considered equate to potential energy of 40 MWh. Generator capacity could be 4 MW or more depending on the time required to run. The potential income from “arbitraging”, ie buying cheap power to pump and generating at times of expensive power, could be $1 million per year. The granite wall would withstand the daily cycling involved as it is impervious. There would be no safety issues as the water level would change slowly, but some kind of cage would be required over the outlet pipe. The reservoir would still be available for recreation. Another possible purpose for generation could be to level the output of the Cherry Tree Range wind farm across the river. This entry was posted in Uncategorised on February 1, 2017 by Richard Telford. Please join the BEAM committee, along with Euroa Environment Group and Strathbogie Voices at our annual end of year celebration at Tahbilk Winery, Nagambie. Come along and bring your friends – it should be a great day out. See details below, and a map to the venue here. Please RSVP to book your spot! email: beam.inc@hotmail.com or call Caro on 5784 1177 or 0400 831 330 Download the PDF of the flyer here. This entry was posted in Uncategorised on November 21, 2016 by Richard Telford. Rivers and Ranges Community Leadership Program (RRCLP) is the newest of Victoria’s many leadership programs. The program covers the municipal areas of Mitchell, Murrindindi, Nillumbik, Whittlesea and Yarra Ranges. The program is based on community capacity and resilience building for the purposes of creating leaders connected to their local regions. As such, they are well placed to identify local issues and needs and identify solutions. Leaders are a good resource in building resilient, connected and thriving communities. The program takes a group of up to 24 diverse participants through a ten-month learning experience and exposes them to leaders at all levels of government. At the completion of the project the participants are expected to participate in community leadership and service. Each cohort of RRCLP completes an environmental or art project as part of their learning. This year’s cohort split into two teams to complete separate environmental projects. Team Bravo have chosen to tackle the problem of plastic in the environment. We are working with the Flowerdale Men’s Shed to produce a song about the 5 ‘r’s – refuse, reduce, reuse, repurpose and recycle. This song will be released via social media and we will attempt to measure the project’s impact via this platform also. As a complimentary addition to the project, we have printed reusable calico bags which we will distribute at the November Tallarook Farmer’s Market complete with information regarding the dangers of plastic and ways to reduce its use. These bags will also contain either a reusable keep-cup or reusable plastic drink bottle. Children at the Flowerdale Primary School decorated some of the bags during a session where they learned about the 5 ‘r’s. We have surveyed the children on their use of the 5 ‘r’s and will measure the impact, if any, at the completion of the project via a follow-up survey. We are hoping the final survey will show a decreased use of plastic and a better understanding of the issues. The children were very engaged during their session. Collaboration with other community groups was another strong element of our project and we will be creating a map to show connections between community groups both before and after the project’s completion. BEAM Mitchell Environment Group was very supportive of our project and have produced a flyer with tips on reducing plastic use for inclusion in the bags. Many other groups offered support along the way. All involved groups will be acknowledged by use of the bags. You can follow our progress on our facebook page by the name of Plastic Not So Fantastic. And now here’s Charlie Mgee with his song Plastic! from his new album Grow Do It. This entry was posted in Uncategorised on October 20, 2016 by Richard Telford.